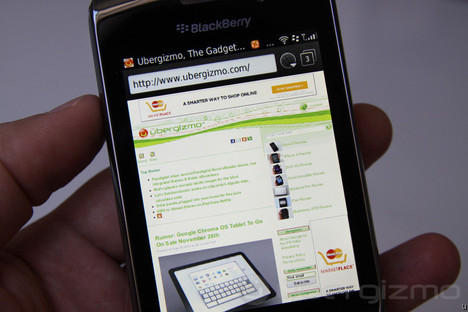 Blackberry Torch – Be Mobile with BMOB.com! 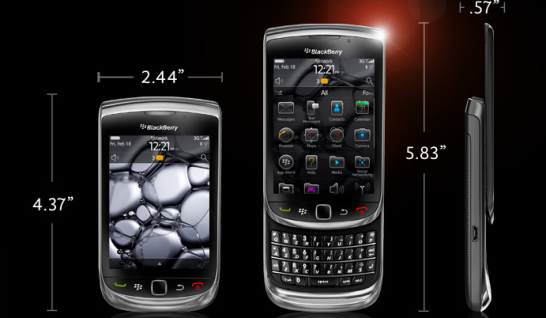 The most noticeable aspect of the Blackberry Torch is the form-factor. 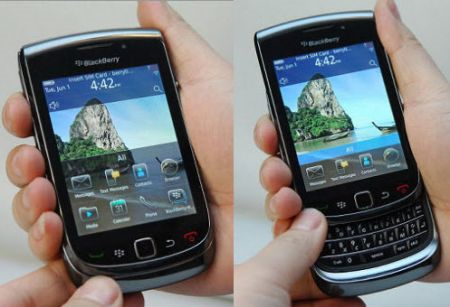 Fairly unique, RIM, the manufacturers of Blackberry has decided to use the portrait slider design. Touch screen phones with a full QWERTY keypad on the side are fairly common but the Torch, with the portrait layout is almost unique. The build quality of the Torch 9800 is similar to other Blackberry products, so we can safely say, it’s perfect! Moreover, the 9800 feels very similar to its portrait predecessor the 9700 apart from the thickness, because of the neatly laid out QWERTY keypad. commendable and there are very few cases of dropped calls and zero reception. With both the multi touch capacitive touch screen and the QWERTY keyboard at hand, messaging of all types and email are a breeze on the go. The keypad shows up on the screen if you don’t feel like tapping at the keys. The Torch comes preinstalled with the BlackBerry Instant Messenger that makes life very easy for you by organizing your messages in any order you like. However, the Torch disappoints in one aspect of messaging. If you do not have a BlackBerry Internet Service email account, you cannot use the device for synchronizing your emails. The Torch offers to users, two inboxes for emails; one is dedicated to your service provider and the other is the standard messages folder. While the plugin and inbox for the dedicated email has every feature that is there for the native email, the messages folder doesn’t have anything. For example, threading conversations is standard in Gmail, Hotmail and the like but the messages folder doesn’t do any of this. If that is not bad enough, your emails are sent to both inboxes and when you select the notification of your home screen, you are redirected to the messages folder! All the revamping has improved the aesthetics of the emails and other messages but you will be limited to using the unified inbox which is not all that great in terms of convenience. The Torch comes with an app called Social Feeds which integrates all your social networking needs. Facebook, Twitter etc. While this sounds good, the option of handling the same content in different locations and with different methods persists and is fairly annoying to the user. Why anyone would want to read facebook notifications in two or three different locations is still not comprehendible. before, you won’t have to use the below average default browser if you switch to a Torch. Moreover, the menus are less complex and the number of submenus is much less. In addition, there is a universal search, like the one in the Start menu of Windows 7 on your computer, which is very efficient and can find just about anything on the phone. The Blackberry Torch 9800 is well designed and weighs a robust 161g. There is a psychological uplift that comes with handling something that is so heavy but very smooth at the same time. With a solid build using plastic that feels like metal, the Torch stands out among the horde of smartphones. Hardware of the phone is top notch too. The rear camera is a 5MP snapper with auto-focus that takes crisp images. The camera menu interface is simple to use and has adjustable settings. Quality isn’t going to match up to a dedicated camera, but it was decent enough with minimal noise. Video capabilities of the phone are substandard. With smartphones that have 720p video recording on the market, RIM really needs to restructure the video recording aspect of the Torch. screens was dropped in the Torch and nobody really understands why. If RIM is reading this, then they should know that a revamp of the display with an increased resolution to at least 480×800 is in order. The Torch doesn’t stop with all this in place. There are some very thoughtful add ons that are very useful to the user. For example, the proximity sensor near the earpiece detects when you are on the phone and turns off the display. This saves battery on long calls and improving battery life is something that RIM should seriously consider. of the existing apps so you will have to wait for solutions to all that which is missing from the Torch. For its price, the Torch doesn’t seem worthwhile right now. Perhaps with an improved interface and new applications you can consider buying it. However, a portrait phone with capacitive touch and QWERTY keypad is rather rare and if you feel the need right now and think you can live without all the misgivings, then go for it.